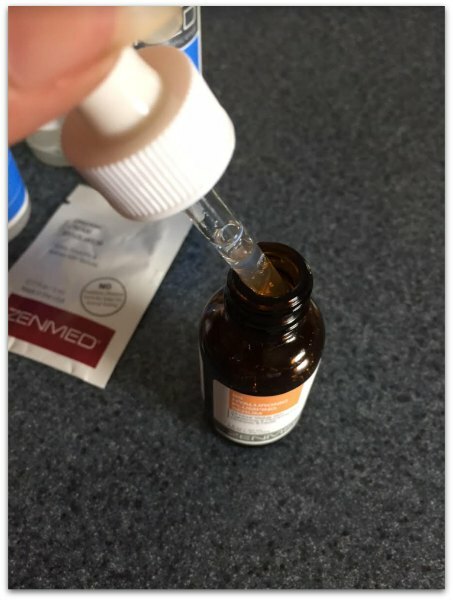 ZENMED contacted me and asked if I would like to try some of their products. Being a product junkie I said, “Yes!” and told them I was a having some issues with PMS acne and being in my forties could always use anti-aging products. Here is a sampling of the products I received and my thoughts. 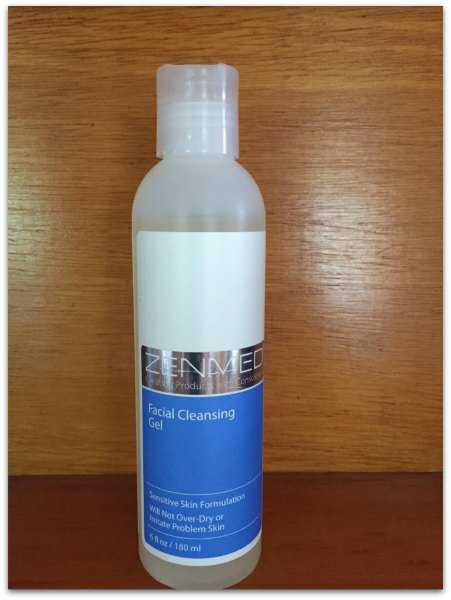 I have been using the ZENMED Facial Cleansing Gel daily. Any proper skin care routine begins with a good cleanser. I found this cleanser to be quite good. It slightly foams up, has only a hint of fragrance, and leaves my skin feeling smooth and refreshed. It did not dry or irritate my skin in any way. The product is made from 100% vegetarian ingredients and is not tested on animals. The price point also reasonable for this product and I would say that I could certainly add it to my skin care routine. Here is where things got a bit tricky! I thought I was having a reaction to the AHA/BHA Complex, but what was actually happening was my dead skin began flaking to reveal smooth healthy skin. Phew! I had no idea how blocked my pores had become until this product began clearing them up! To apply you just spray the product onto a cotton pad and apply a thin layer to your face. Following up with sunscreen is very important because it can cause sensitivity and sun damage. I had to be careful with this as we go out boating and I am in the sun a lot. The funny thing is that since I started to use this product I probably have become more conscious of wearing sunblock and taking care of my skin when it comes to the sun. I’d say we have a win-win here! 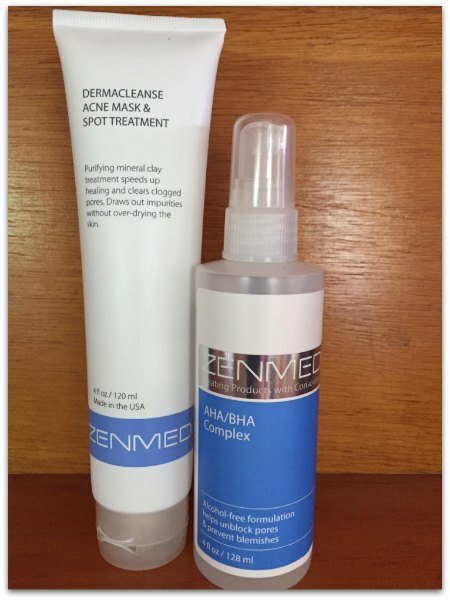 The next product is the Dermacleanse Acne Mask & Spot Treatment. Of course when I have these products sent to me I have no problems with acne! I tried this product on my husband and 2 sons. Yes, I tried it on teen acne! Here is what I can say about it: Gentle and not drying. It has been fine on teen skin and has been keeping the acne in check. No huge breakouts and I feel good about letting them use it. I am 100% convinced that this product has improved my skin! Since I started to use it I feel as if my skin is definitely tighter and smoother. Is it because I’m paying more attention to its care? I don’t think so, I think this serum has brightened my appearance. I’ll close this post with a before and after photo of myself. I did not take these for the purpose of this post. 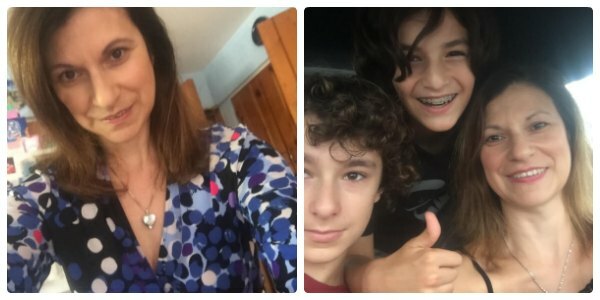 I just happen to have these on my phone and I thought to myself, “I look better than I had in the past pics.” Even if it’s only in my head it’s worth it! 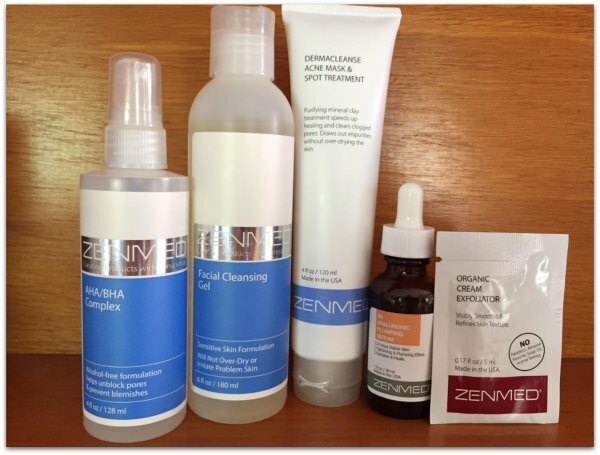 Visit ZENMED online and check out what products they might have for your skin condition and care! Do you wear sunblock daily and take care of your skin? Disclosure: I received products to try in exchange for a review. All thoughts belong to me and have not been influenced. The effects are visible and I am sure it is a good product. But will it work on every skin type? I am in my 30s and always looking for new skin care to try! Sounds like this one is great! Thanks for sharing. I love finding new products that work well. These look like products that my older daughter and I would use. I want to try the exfoliant. I love trying new skin products! I have so many problem areas that it’s hard to find a good product. I will have to look into this and definitely try the AHA/BHA Complex. Glad to hear that it helped your skin! I love reading and finding out about skin care products and knowing which ones actually work! That plumping serum looks great for me! Being in my 40’s I am always looking for good skin routine. Can this be used even if you have had skin cancer? It’s really cool that the AHA/BHA Complex had such a noticeable effect on your skin. I wonder how my skin would look after using it. This sounds like a great line. My skin has definitely changed as I’ve gotten older, and I need to look into this. Tighter and smoother would be great! I need new skin care products. I have been using the same things for years. I may need to check this out. This seems like a great skincare line to buy. I will have to check it out sometime. I’m not the best at wearing sunscreen daily. I try my best to remember though. I do use a daily moisturizer.